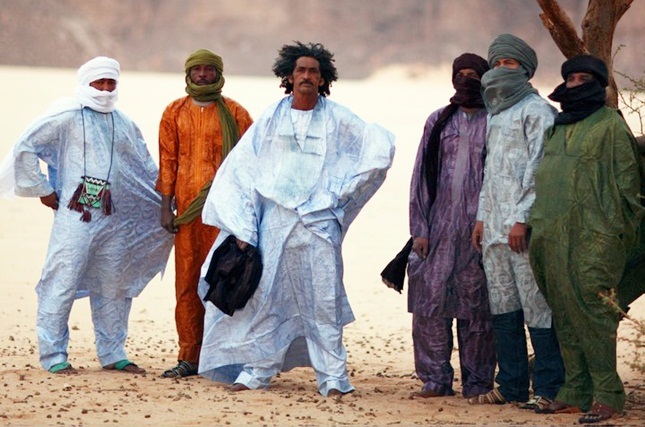 Tinariwen have taken Saharan music to a whole new level over the past few decades. Their latest album Tassili slightly shifted towards a new direction. Here’s my verdict. How often do we listen to a song for the first time, either love it or hate at once, only to change our mind later on? Normally, critics rush into reviews as soon as an album comes out, but this time, I have decided to adapt the opposite attitude. I have thus given myself enough time to reflect on the Touareg rocker’s new release – for a Tinariwen album is not to be taken lightly. If the general atmosphere somewhat surprised me at first – and I weigh my words – I convinced myself to give it more time. Therein lies the reason for this late review, in case some wondered. The opening title Imidiwan Ma Tenam kicks off with these typical syncopated guitar riffs which have featured since the birth of the band, followed by an enchanting, almost dream-like, melody which then progressively makes its way in. 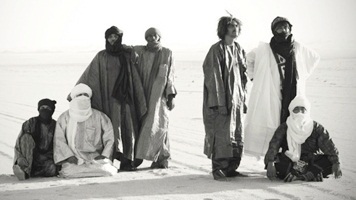 Thereby the US guitar virtuoso Nels Cline introduces a brand new dimension to Tinariwen’s music – an unfamiliar context for him. If a manifest enthusiasm emerges from the first notes, too many of the following titles cannot really start the fire. Imidiwan Win Sahara, or Tilliaden Osamnat, are too reminiscent, almost excessively of previous productions. Moreover, these songs are no longer part of this ensemble, whose synergy between strong and innovative melodies was representative of the band’s earlier success. Indeed, some of those who had contributed to the Tinriwen’s musical richness through the years, such as Abdallah ag Alhousseyni and Wonou walet Sidati, have gone missing, which is a surprise. Most titles are almost exclusively the fruits of Ibrahim ag Alhabib’s work. The one who is still seen as a local hero for most of the Touareg community has not lost his great music writing skills, but in the end, Tassili turns out to sound like Ibrahim’s solo work. It globally lacks some diversity and hit-titles which could have driven this new piece. However, a few goes at the album bring out a sort of charm, whose subtle character should mask the actual beauty of the songs. Ibrahim takes up once more the assuf imagery, a typically Touareg notion evoking the nostalgia and solitude of the Saharan traveller. That might be the reason why Tinariwen relocated in Tassili for the recording, southern Algeria, a region through which Ibrahim passed many times when many Touareg ishumars (unemployed) wandered around the desert. Tameyawt or Iswegh Attay thus evoke a both heavy and warm atmosphere, redolent of a campfire after a long journey. But all is not about Ibrahim. A few western artists make special appearances, yet another novelty. In addition to the abovementioned case of Nels Cline, the New-Yorker Tunde Adebimpe gets on the chorus of Tenere Taqqim Tossam while slipping soft vocal harmonies in Walla Illa. A little of New Orleans turns up thanks to The Dirty Dozen Brass Band that showcases their brass playing skills on Tameyawt Ya Messinagh. This produces an ingenious, if not breathtaking, result which will nevertheless make the purists of the genre turn pale. Ultimately, the one whose presence has been deeply missed, Abdallah ag Alhousseyni, concludes the album on the closing track Takest Tamidaret. But the expectations might have been too high for this pleasant but eventually not so exciting song – perhaps like the album? No one could accuse Tinariwen of making the same music over and over again. Despite highs and lows, Tassili stands as a quality piece of work regardless. A certain lack of fusion between energy and finesse might disappoint but overall, the album offers compositions, sometimes innovative, sometimes redundant, but captivating as always.